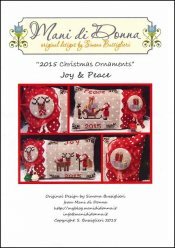 2015 Christmas Ornaments: Joy & Peace [H1594] - $12.00 : Yarn Tree, Your wholesale source for cross stitch supplies. Cross Stitch pattern from Mani di Donna. Tis' the season! These Christmas designs would be great to stitch on a couple of pillows for your guests to enjoy! The "Peace" design features Santa with his sleigh full of gifts to deliver to all the children. One of his elves is along to help as well! The "Joy" design features Santa carrying his bag of gifts with one of his reindeer standing next to him. Look closely & you will see a cardinal sitting on the back of the reindeer. A reindeer & gift button can be stitched to put on the pillows as well. Stitched on #7168 Zweigart Belfast Petit Point Raw/White 32ct. Stitch count for the joy design is approximately 55W x 49H. Stitch count for the peace design is approximately 52W x 49H. Stitch count for the reindeer button is approximately 17W x 12H. Stitch count for the gift button is approximately 17W x 16H.